"An apple a day keeps the doctor away." And with good reason. Apples are packed with fiber, antioxidants, vitamins and nutrients - and all for around 80 calories per medium-sized apple. To sweeten the deal, not only are apples nutritious, they are also delicious. 1. Apples originated in Turkey and where they were transported throughout the world through ships and merchants many centuries ago. 2. Today there are around 7,500 varieties of apples grown around the world. Although 2,500 varieties of apples grow in the U.S., only 100 varieties are grown for commercial purposes. The most popular variety of apple in the U.S. is the Red Delicious. 3. Apples belong to the rose family of plants. Other members include pears, peaches, plums and cherries. 4. At the grocery store or your local farm stand, choose apples that are firm, with no soft spots. They are most likely to be full of juicy flavor and crunchy texture. 5. To store apples, it’s best to keep them in the produce or crisper drawer in the refrigerator at around 34°F. They will last up to ten times longer when kept cool, compared to that nice-looking bowl of shiny apples on your dining room table. 6. Most of the good stuff in the apple is in the skin, so don’t peel away those great nutrients. One medium apple, about the size of a tennis ball, or 1/2 cup chopped, cooked or canned apples equals one serving. So does 6 ounces of 100% apple juice or 1/2 cup store-bought or homemade applesauce. It couldn’t be easier to add apples into your family’s diet. Start with breakfast, by tossing some chopped apples into hot quick-cooking or instant oatmeal. Add a pinch of cinnamon and dash of brown sugar or maple syrup. Put a spin on the traditional ham and cheese or turkey sandwich for lunch; slide in a few thinly sliced Granny Smith apples. Sliced apples atop of baked chicken makes a delicious fall dinner. Don't forget all the countless, easy to make, apple desserts that always tempt our taste buds! Once you get your hands on some fresh apples, head here to find recipes for any meal featuring apples. This apple originated in New Zealand in the early 1950s, as a chance seedling with Lady Hamilton and Granny Smith as possible parents. Now grown in the United States, Braeburn is a multipurpose apple good for all types of apple uses. Its color varies from orange to red over a yellow background. This crisp, juicy apple has a rich, spicy-sweet flavor. U.S. Braeburns are available beginning in October through July. This new apple with an old-world name was discovered as a chance seedling in the late 1980s in Washington state. Cameo® makes its cameo appearance beginning in October. It bears red stripes over a cream-colored background. Extra-crispy Cameo has a sweet-tart taste. This apple resists browning, making it a natural choice for salads and fruit trays. Cooks, please note that Cameo's extra-denseness takes a bit longer to cook. Cameo is a registered trademark of the Cameo Association. Originally developed in Japan in the late 1930s and named after the famous Mt. Fuji, U.S.-grown Fujis began appearing in markets in the 1980s. Fuji is a cross between Ralls Janet and Red Delicious. This variety's popularity is skyrocketing, thanks to its sweet flavor and firmness. Fuji apples are bi-colored, typically striped with yellow and red. They are available year round, beginning in September. A Virginia grower discovered this apple sprouting amid the ruins of a hurricane-devastated orchard in the late 1960s, and named this greenish-gold, sweet-tart apple after his sweetheart. Its parentage includes Albemarle Pippin, a favorite apple of Thomas Jefferson. This early-season Eastern apple is great for salads, and cooks well too. Available in limited but growing supplies starting in mid-October. This Australian native was discovered in 1868 as a chance seedling by "Granny" Anne Smith of Ryde, New South Wales. One parent might have been a French Crab Apple. Grannys are known for their distinctive green flesh, which sometimes bears a red blush, and their very tart flavor. An all-purpose apple, Grannys work equally well as a snack or in pies and sauce. U.S. Grannys are harvested beginning in August, and are available year-round. 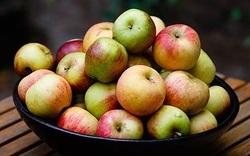 This variety of apples was discovered in Woodstock, N.Y., in the 1920s and is known for its use in pies and applesauce. This crimson apple with occasional touches of green has a spicy tang that blends well with other varieties in sauces and cider. Jonathan is typically available from September through April. So the old saying is true: An apple a day CAN keep the doctor away! Thanks for stopping by, and check back each week for updates, new articles and recipes!